I’ve been wearing my new Baridi White MBTs for about a month now. I didn’t think I’d like them at first. The company altered the shoes for a lower pitch. But I changed my mind. They’re great. I wear them to the gym and keep them on while I run the treadmill and do the EFX machine. They look cool enough to wear around town and are fit to walk, hike or work out in. 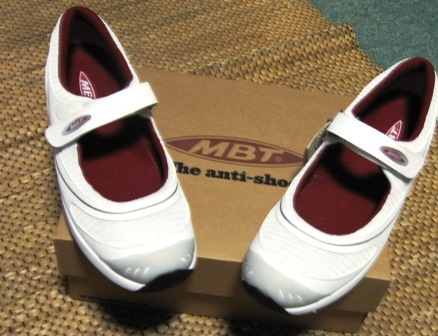 MBT launched a whole new line of shoes from sandals to athletic styles, so check them out on the web site. These are the best shoes for your feet. I know I now am the proud owner of four pairs. I’ve been writing raves about MBTs for a few years now–ever since I scored a pair at an Oscar Swag party. Once I tried them I loved them so much I went out and bought another pair for me and one for my husband Richard. Richard has a knee problem and was suffering from a plantars faschitis (sp?) anyhow the MBTs enabled him to continue taking morning and afternoon hikes with me. 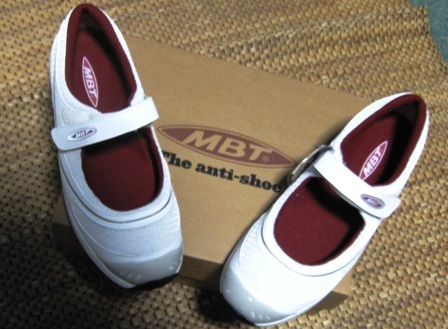 Check out www.MBT.com to learn all about these amazing shoes and see the latest designs.